Actress Madhubala 86th Birthday Anniversary Celebrates on Google Doodle. 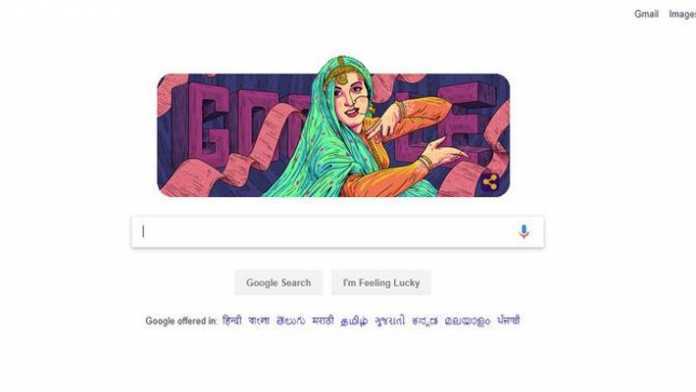 Today, Google dedicated on its doodle to the iconic Actress Madhubala. Popularly known as ‘The Marilyn Monroe of Bollywood’, actress Madhubala was known for her beauty, the personality and sensitive portrayals of women in films. Raised in the slums of Bombay, she supported her family as a child star and soon became a leading lady known for her elegance on screen and considerable acting abilities. Madhubala Born in Delhi on this day in 1933, Mumtaz Jehan Begum Dehlavi was raised in a town located near the Bombay Talkies film studio. Madhubala appeared in her first film at the age of 9, billed as Baby Mumtaz. In 1947 she landed the lead role in Neel Kamal at the age of 14, taking the name Madhubala. As the family’s main breadwinner, she worked tirelessly to support her parents and four sisters. Madhubala appeared in nine films during 1949, including a spellbinding breakout performance in the box office hit Mahal. Madhubala’s life and career were cut short when she died on 23 February 1969 from a prolonged illness at the age of 36. Her film Chalak opposite Raj Kapoor was supposed to be released in 1966 as it needed a short spell of shooting, however, she couldn’t even survive that strength and therefore, the film was left incomplete even at the time of her death. On Madhubala 86th Birthday Anniversary Theprimetalks wishes her a very happy birthday.